The Mayo Portland Adaptability Inventory (MPAI-4) is an industry-wide tool adopted by the Brain Injury Association as a national standard, and looks at functioning across 35 separate and distinct variables. The MPAI-4 is used to determine the severity of a brain injury. Eisenhower Center completes this assessment for every client upon admission, regularly while they’re under our care (“follow-up”), and again at discharge. 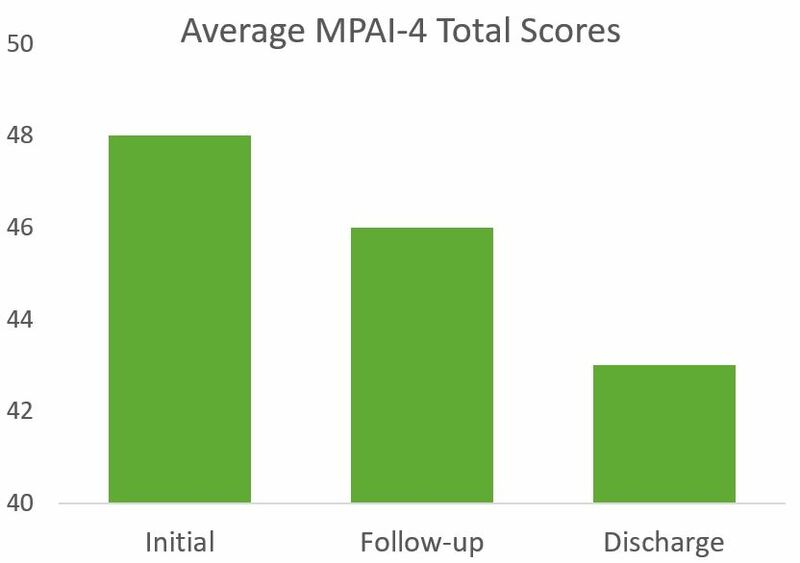 This graph shows average scores for all clients at admission, follow-up, and discharge. Higher scores indicate severe injuries, lower scores indicate more mild injuries. While a drop of three points may not look like much, Eisenhower Center ran a two sample t-test for initial vs follow-up (p = .00158) and initial vs discharge (p = .01887), which proved statistically the effectiveness of our programming. (p = .10) Simply put: Our clients make meaningful progress while under our care. Collectively these three categories give us insight into the success of our programming, and tell us if we’re helping the injured towards their maximum potential. 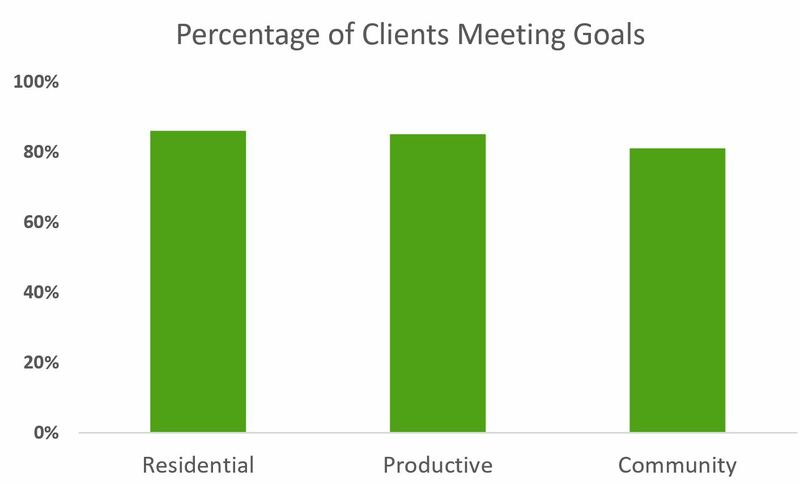 The graph to the right shows that over the past year, approximately 86% of those we serve are meeting their residential goal, 85% are meeting their productivity goal, and 83% are meeting their community access goal. The rest of our success is measured by you, the people we work with on a daily basis. That’s why we’ve created a tool for you to give us feedback about how we’re doing. If you have a free moment, please click here and take our satisfaction survey. The feedback you provide is important, and helps us improve our programming. Please also take a look below at our most recent years worth of data (2016) to see how case managers, family members, and other external stakeholders feel about our Center!